Who Is This Jesus… And Why Did He Come? In the rush of the holidays, we often miss “the why” of Christmas.The hustle and bustle of gift-buying, party-hopping, and tree-trimming can quickly smother the purpose of celebrating the birth ofour Lord and Savior, Jesus Christ. 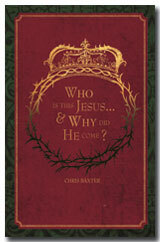 This 25-day devotional, Who isthis Jesus, and Why did He Come?, is meant to give you a designatedtime to slow down, and reflect over the holy-days. Choose to readthese specific scriptures about our King as a personal quiet time, oras a family devotional. Take time to be still, meditate, and savor Hisgoodness; and then… celebrate the wonderful truths of who Jesus is,and what He gives each heart that believes.